In his spare time, theoretical physicist, cosmologist, and astrobiologist Paul Davies exerts his role as an author. As his Amazon page describes, he has written at least twelve published books often on some existential question about life (or the dearth of life) in the Universe as informed by science. Davies has claimed he seeks to “bring the message of science and religion to the people” and, being a physics savant, was awarded funds from the Templeton foundation to support his research on “the natures of time and consciousness and extraterrestrial life”. One of his more recent books, The Eerie Silence, overlaps with his research interests and can be described as intellectually provocative. Figure 1. 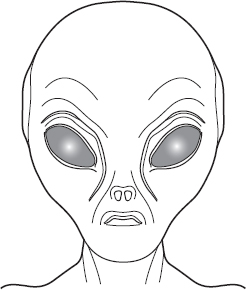 Above is a popular image of what an alien would look like. Science fiction and pop culture have spawned this image as the most likely visage of ETI. The source is The Eerie Silence. If we were to encounter alien technology far superior to our own, would we even realize what it was? Think how a laser or a radio would seem to a tribe of rainforest dwellers who have never been in contact with the outside world. Now imagine a technology a million or more years in advance of ours: it might well appear miraculous to us. All of which presents new SETI with a serious problem. How can we look for signatures of alien technology when we have no idea how it would be manifested? 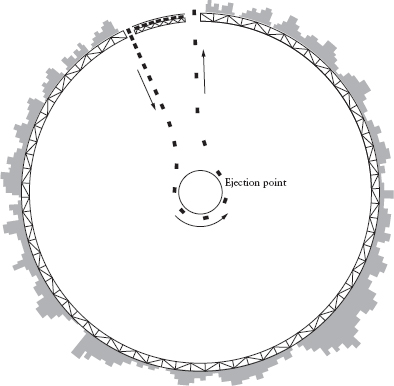 In the previous chapter I suggested some ways in which an advanced civilization spreading across the galaxy might leave traces of its activity. But all the examples I gave were based on extrapolations of twenty-first-century human physics, and so are tainted by anthropocentrism. Suppose that alien technology is based on principles that are completely beyond the ken of our best scientists? Figure 2. Above is a whimsical depiction of energy extraction from a rotating black hole seen in The Eerie Silence. A truck can be thrown into a black hole and ejected with more energy than it originally had thanks to the conservation of angular momentum. Wheeler dreamed up the amusing scenario [in] which trucks containing industrial waste are dropped on a carefully calculated trajectory towards the spinning black hole. […] The trucks spill out their contents in such a way that the waste is devoured by the black hole. For certain trajectories, the empty trucks get propelled away from the ergosphere at high speed, zooming off with more mass-energy than the laden trucks originally had going in. Ultimately the additional energy has to come from somewhere, and in fact it comes from the rotational energy of the hole; every time the trick with the trucks is performed, the black hole’s angular speed drops a bit. The good times will not last for ever – eventually all the rotational energy will be extracted and the civilization will be obliged to decamp elsewhere. But at present human levels of energy consumption, a black hole could meet our energy needs for at least a trillion trillion years. does not consist of discrete, separate things; rather it is a system, or a subtle higher-level correlation of things. Technology is, in the broadest sense, mind or intelligence or purpose blending with nature. Importantly, technological devices don’t subjugate nature; the devices still obey the laws of physics. Technology harnesses the laws; it does not override them. […] Truly advanced alien technology might manifest itself by an entirely new form of whole–part interrelationship. And just as quantum weirdness is uncovered only with very special apparatus, so alien technology might go unobserved and unsuspected, because we are not viewing it with the equivalent of… well, a Bose–Einstein condensate beam-splitting interferometer. However, while we may not completely understand the Universe, there exist certain laws that we can be fairly sure of, notably the second law of thermodynamics and the maximum speed of light. Davies uses these laws to dismiss science fiction, such as a quantum vacuum drive (violates the second law of thermodynamics) and levitation (violates the law of gravitation). To this blogger, this chapter by Davies discusses one of the unsettling things about SETI: its apparent indifference to its existential problems. While astrobiology can rely on our understanding of the biochemistry of terrestrial life (particularly bacteria), SETI is limited to humanity’s machinations. SETI experiments have varying levels of assumptions and most palatable are the parasitic searches focusing on Dysonian SETI. Once cultural assumptions come into play, SETI quickly devolves into fantasy. While a given experiment may be a null result, if it explores a subset of an infinite-dimensional manifold then it is scientifically useless. SETI should proceed but should take caution to limit itself to experiments where a scientific result can say something informative. To this blogger, a reasonable way to search for life would be to start with unintelligent life within our own Solar System, then work together as a scientific community towards extraterrestrial intelligence.